You’ve read a few books on copywriting, and many many blog posts. Heck, you’ve even followed a copywriting course. But when you sit down to write your own copy? You feel like a mumbling ignoramus. You’re unsure where to start. You don’t know what to write. You fidget. You check Twitter. You make another cup of tea. And answer a couple of emails. And that’s a polite way to say it, because you feel like screaming, using foul language, and throwing your computer out of the window. 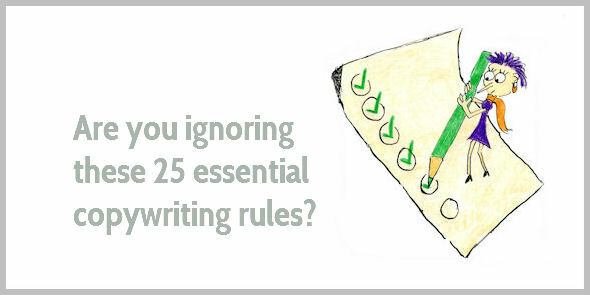 In this blog post, I reveal the 25 copywriting essentials every business owner must know. These 25 rules help you understand what to write and how to write, so your copy becomes more persuasive and you can sell more. Good copy starts with knowing who your audience is. If you don’t know who you’re writing for, you can’t sneak into people’s minds and address their needs, fears, desires, and secret wishes. Good copy is stolen rather than made up. Don’t swipe copy from your competitors (that’s plagiarism; plus your competitors probably don’t know what they’re doing). Instead, steal copy by listening to clients and prospects. Use the same language your buyers use to connect with them. Avoid jargon and complicated words your readers don’t understand. Don’t expect your copy to appear magically when you start typing. Apply a solid copywriting process of research, planning, writing, and editing. Good copy is carefully crafted, step by step. Start at the end. You can’t write compelling copy if you don’t know the goal of your content. Each paragraph and each sentence should contribute to achieving that goal. Have a genuine interest in helping people. Solving real problems is more important than understanding persuasion tricks. Even the highest-paid copywriter can’t write good copy for a product nobody wants. Translate each product or service feature into a benefit by asking yourself So what? Why would your reader care about this? Apply the inverted pyramid. Put the most important information first. Write for scanners and readers. Scanners want to grasp your main story by skimming your headlines, subheads, and bullet points. Readers want to know the finer details. You’ve listened to your clients, and written your draft copy with their needs and wishes in mind. But how can you make sure new clients believe you, and trust you, and want to buy from you? How can you nudge them to contact you? Persuade with emotion. Back up with facts. Appeal to people’s emotions to seduce them to buy, and help them justify their purchase with logic and facts. Engage readers with stories—they’re more riveting than sales pitches. Avoid bragging about yourself because it’s a turn off. Boost your trustworthiness with non-sugary testimonials and story-based case studies. Take away reader’s objections to buying from you. What’s stopping them from taking the next step? Boost your credibility with social proof. Let people know who else has hired you or how many projects you’ve completed. Create a sense of popularity by mentioning your waiting list. Appeal to people’s fear of loss. What are people missing by not buying from you? Overcome buyer’s procrastination by nudging them to take a decision. Apply the power of scarcity: offer a time-limited promotion, create a limited edition, or have limited availability. Or add a countdown timer to create a sense of urgency. Embrace the power of free. Free shipment or a free bonus can have a higher perceived value than a discount. Reduce your buyer’s risk with a guarantee. Because it can give people the confidence to buy. You’ve created an irresistible offer. You’ve nudged readers to make up their mind. You know they’re ready to buy from you. Be bossy. Add power to your words and make your call-to-action impeccably clear, so people will press that Buy button, or contact you for a quote. Scrap wordiness, avoid clichés, and cut weak phrases. Make sure each sentence and each word contributes to reaching your copy’s goal. Lazy editing slows your readers down, and that increases the risk they might not even reach your call to action. Make sure your copy is specific and precise. Specific facts add substance to your arguments while drivel undermines your credibility. Avoid superlatives like fastest, simplest, or safest unless you can prove you’re the best. Check for common grammar and spelling mistakes. You don’t want to look silly, do you? Read your copy aloud and listen to its rhythm. Your readers will notice whether your sentences plod and stumble, or whether your copy skips and whistles. Writing sales copy makes us want to hide. Only you know who your favorite client is. Only you understand what you’d love to offer them. You don’t have to employ sleazy sales techniques. You don’t have to trick your readers into buying. Simply explain which problem you solve. Make a clear offer. And nudge readers to take action. Thanks for the checklist, Henneke. I’ve recently gone back to sharing my stories and can see a marked increase in level of engagement. Yep, stories work well in blog posts, too. I really found the ideal reader profile amazing. Would find it fascinating to see your answer to those questions just to see if we who follow you fit that profile. Thanks. So well done. These are great tips! Love the way they’re not the same-old, same-old. I agree with your response to the previous comment. On my first website, MidlifeCareerStrategy.com, I specifically addressed midlife career changers. Surprisingly many people hired me who I wouldn’t call midlife – they were younger! Love your advice to Be Bossy (I’m still working on that even though I write copy!) and will end up quoting you someday when you say “drivel undermines your credibility.” You could put that one on a tweet-out! That’s interesting – even though your domain name clearly indicated your services were for midlife career changers, younger people clearly still felt you were addressing their needs! I love writing opening paragraphs. They’re probably my favorite part of blog posts! When I write sales copy, I try to imagine having a conversation with my ideal reader. They ask me a question, I answer it, they ask a follow-up question and so on. I find this the easiest way to write sales copy. Thank you, Henneke. I loved the ideal reader profile. It was fun to fill out and opened my eyes. My ideal reader is someone like myself. Is that strange and narcissistic? Nope, that’s quite normal. A lot of people write for someone similar to themselves or to their younger self. It makes it easier to know what your readers are struggling with! Super blog post again, Henneke. The inverted pyramid makes me think of Dave Trott. He uses that format too. Impact is at the top, communication in the middle and persuasion below. He argues that everyone is focussing on persuasion, as if they already have a big audience they are catering for. Which is a mistake, at least for most small businesses. First and foremost you have to get attention. Then you have to make sure you hold that attention long enough to communicate what’s relevant for you ánd your potential customers. And, finally, persuade them to let you take care of it. Yes, that sounds good. Persuasion “tricks” only work if you have an audience and capture your audience’s attention first. Get the basics right first. I’ve read one of Dave Trott’s books and liked it. I’ll have a look at the video later (it’s a bit long for watching tonight!). I’ve read Predatory Thinking. Dave Trott is an excellent copywriter, who understands why and how you have to cut things back to the essential bone(s). Hope you enjoy the video! One of the great benefits of #12 (testimonials and case studies) is that you can learn heaps about your customers from the answers they give – for instance, how they found you, what they were looking for, and what aspect of working with you they found most valuable. Their answers are a big help with points 1-3 on your checklist (knowing your audience and using their language). Yep, that’s so true. I’ve changed the copy for my blogging course based on the testimonials I’ve received. Thank you for adding that point, Richard! Love your work. Thanks for sharing. Keep it up! It’s all about the soft-sell, isn’t it, really? You’re so right when you describe it as “simply explaining which problem you solve”. Keeping up-to-date with what your target market are talking about (and complaining about) is a great way to find out how to woo them. One way, I found to get writing (and put that cup of tea on hold) is to read readers comments. I get such ideas there that I’m sometimes having to reign myself in. Reading out copy is such a help. It’s surprising how words sound different when spoken aloud. This is a sure-fire way to write better copy. And yep, I agree about reader comments. I’ve learned a lot from reading comments, too. Great points made here in this post. The point “Good copy is stolen rather than made up” is interesting because I’ve constantly heard other copywriters say swipe files. Obviously don’t copy but emulate what they’re doing and HOW they construct it. Yep, a swipe file can be handy. But as you say, people shouldn’t use their swipe file to copy thoughtlessly, but to understand why and how techniques work and then apply the techniques that suit their own voice. Thank you for providing such a concise and readable distillation of copywriting best practices. Thanks, also, for the PDF. I’m constantly amazed at the amount of wisdom you manage to share in such a readabke format!